Photo: The massive Richman factory was once the most advanced clothing factory in the US. Over the past decade large American corporations have reported record breaking profits hand over fist annually. These astronomical profits, however, have not translated into more American jobs. In fact the trend is working in a counter-intuitive direction. Job security, retirement benefits, union representation, workers’ rights, vacation time, livable wage rates and other progressive workplace stalwarts are under heavy assault. One end of the current political narrative has demonized the working class as responsible for the economic downturn, while simultaneously supporting tax breaks for companies that create jobs… overseas. In its heyday, the Richman Brothers Company was not one of those businesses looking to maximize profits by putting the welfare of its workers at risk. The company’s greatest asset was not its bank account balance, but rather the people that showed up to earn an honest living. Photo: The factory as it appeared after construction finished. If you had a bit of pig iron or salt to trade in 1853 there was a young entrepreneur named Henry Richman that was willing to fit you with proper clothes. The payment-flexible Portsmouth, Ohio businessman moved his garment business to Cleveland in 1879. The founder’s three sons Nathan, Charles, and paternally named Henry breathed new life into the family business and ventured the company into new territory. Nathan began experimenting with selling suits directly to the customer via mail in 1903. Realizing the potential of direct-to-consumer sales, Richman was the first clothier to open their own branded retail outlet in 1907. The strategy proved to be winning formula and the company grew tremendously. The burgeoning operation tapped the Christian, Scharzenberg and Gaede Company in 1915 to construct a state-of-the-art factory in the heart of Cleveland. The architecture of the factory borrows design innovations from Richman competitor Joseph & Feiss. The U-shape design provides ample floor space for operation and maximizes air-flow. Large windows on all sides cut energy costs by providing natural light throughout the day. The original Richman property occupied 17 acres, but expansions in 1924, 1927, and 1929 extended the property to 23 acres. Total factory floorspace amounted to a staggering 650,000 square feet. Photo: Employee earnings report left behind on the factory floor. At its zenith the factory employed around 2500 workers, each of whom benefitted from the progressive business practices the three Richman brothers instituted. 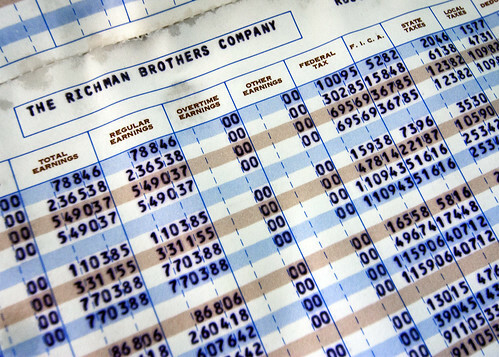 The Richman brothers placed a great emphasis on personal accountability to their employees. Executives would regularly stand at the door and greet every employee by name. Having to look your employees straight in the eye meant that the company took great lengths to insure employee welfare. According to a 1939 Time Magazine article workers enjoyed corporate stock options, three weeks paid vacation, and a 36-hour work week. Female workers received 10 weeks off with a $10 stipend per week to nurture their newborn infants. Sick employees also received the stipend if they were unable to work while receiving medical treatment. The company regularly granted no-interest loans to financially solvent employees. Those in need were often granted outright in-kind donations. Punch-clocks were non-existent in the labor-friendly work environment at the factory. As the economic turmoil of the Great Depression sent the economy into a downward spiral the multi-millionaire brothers took drastic action to insure the survival of their company. After 1931 the three brothers voluntarily took a pay cut. Although they still retained the duties and responsibilities of their positions, their names never again appeared on the payroll. 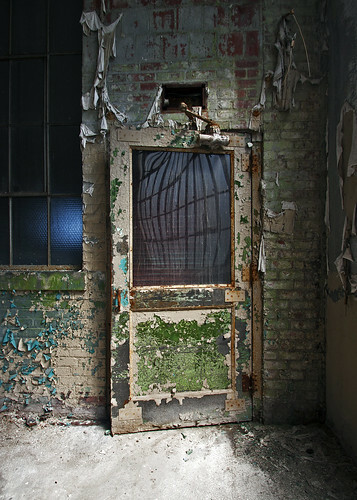 Photo: One of the many heavy doors throughout the factory. During World War II and well into the 1950’s prosperity reigned at the factory. Cousin George Richman led the company to become the largest domestic clothing retailer with 119 stores. Richman fanned out across the country with a number of competitor acquisitions that continued well into the 1960s. In 1969 the Richman Brothers Company was sold to the F.W. Woolworth Company. Under new management the Richman label continued to produce mens and boys clothing. Wooworth, however, did not have the business acumen to weather tough economic times as the Richman brothers had during the Great Depression. As part of a broad strategy to shed underperforming brands Woolworth decided to close 260 Richman retail stores in 1992. Operations at what was once known as the “World’s Greatest Clothing Factory” ceased operations immediately thereafter. 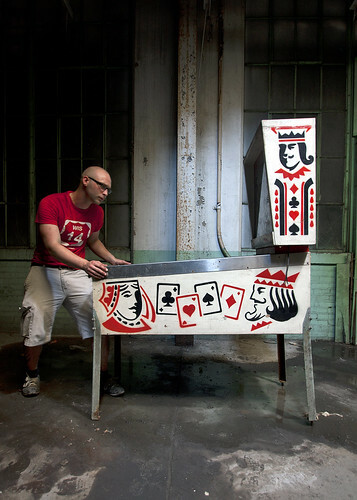 Photo: The author of American Urbex enjoys a game of Royal Flush pinball. 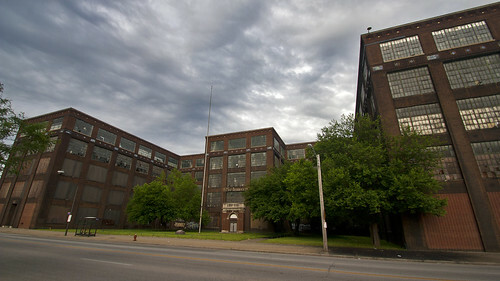 For nearly two decades the dormant boarded-up factory loomed over the Cleveland residential neighborhood that surrounds it. During vacancy the property was briefly considered as a potential future prison site or office space, but plans never materialized. In September of 2009 the property was purchased by a Chinese investment group looking to establish an American presence. Owner Derek Ng is actively pitching the factory as a place for mixed use development. There is not much left at the factory that once was a dominant player in the American clothing market. The factory is a labyrinth of concrete walls and nearly identical façades. It is a ghost of the glory days of American industrial might. It is an homage to the wonders of capitalism, which neatly packaged American jobs and sold it overseas to cut costs. The Richman brothers valued their employees and modeled what a responsible company can do for the working class. The workplace benefits they pioneered were in place long before some of them became commonplace by federal law. Contemporary executives could learn a valuable lesson from the Richman brothers’ stewardship in both hard times and prosperity. Wealth does not necessarily corrupt a man, but few wealthy are as benevolent as a Richman. Ben Savoca – CAD drawings of the building. CGLI – Rendering of a revitalized factory. Cleveland – List of buildings from architects Christian, Schwarzenburg and Gaede. Cleveland.com – Firefighters respond to a fire in the factory. Cleveland.com – A Chinese investment group now owns the factory. Daily Screw – A corkscrew bearing the Richman name. eBay – Richman Brothers clothes for sale. 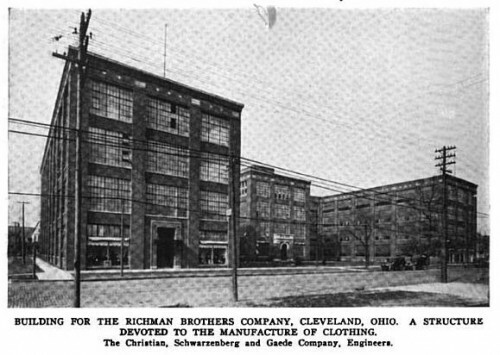 Encyclopedia of Cleveland – Entry for the Richman Brothers company. Encyclopedia of Cleveland – Entry for the history of the garment industry in the city. Go Antiques – Company stock certificate with a picture of the factory on it. Google Books – Mentions Nathan G. Richman receiving an award for philanthropy. Google Books – Photo of the building by the architect. Google Books – Company President Lewman knew his 2000 employees by name. Google Books – News of Nathan G. Richman’s death. New York Times – 1990 article on the promotion of Lee Sutherland to Chief Executive. New York Times – 1992 article on Woolworth closing 260 Richman stores. Ohio History (PDF) – National Register of Historic Places Registration Form that mentions the factory. Scene – 1999 article that mentions the location being scouted for a possible prison. Time – 1939 article about the progressive work atmosphere at Richman. Trademarkia – Trademarks registered to Richman. WKYC – Local news has video of owner Derek Ng and shots inside the building. After I finish scrapping this place I’ll be a “Richman, Brother”. I have a photo of Richman Brothers employees which was taken in mid 1970’s in front of the building. I can send you a scanned copy of it if you like. It is 8X16. I HAVE A TRIBUTE TO CHARLES L RICHMAN : THE FIRST PRESIDENT OF THE THE RICHMAN BROTHERS COMPANY : SEPT 26 1872 TO MARCH 12, 1936 : It STATES THAT ” THIS MEMORIAL TABLET IS AFFECTIONATELY DEDICATED IN LOVING TRIBUTE BY HIS FRIENDS AND CO-WORKERS OF THE RICHMAN BROTHERS COMPANY.” email me at [redacted] if you want it. PS I WILL SEND YOU AN ATTACHMENT OF THE PHOTO? As much as I would like to own something like that, I wouldn’t be able to do it much justice. A local museum would have much more use with a piece like that. EDWARD– My name is Robert and I am interning at the Slovenian Museum and Archives in Cleveland. I am in charge of putting together an exhibition on the Richman Brothers. In our museum we have had several things from the company donated to the museum, I was wondering of you would like to donate your memorial (or at least loan it to us for the duration of the exhibition). Please feel free to email me!!! Thank you!!!! and hope to hear from you soon! How can I get inside this building? I would love to get in and take some photos before it is gone or remodeled. Who do need to talk to to get inside? I know of women threading their needles at home each night to grind out the piece work. All production was piece work. The company gave you a turkey at Thanksgiving, a cheap gift on your birthday and always referred to employees as “the Richman family”. All this smoke to keep wages low and the union out. If you spoke up for a union shop, your piece work would be systematically rejected to ensure your take home pay suffered. Additional intimidation of the long, loyal family members was to keep wages low by hiring WWII refugees at starvation wages. My father gave his health and 40 years of service for a $70/month pension. Corporate sources were the basis for the above article. These are my observations as an eye witness since 1947 and as a professional historian who understands how articles of this nature reach the public. My father just passed away and prior he told me he had a Richman brothers pension (he kept saying Footlocker) for us girls. I’m not sure the years he was there, but do you know whom we would contact regarding this?? Any help or a nudge in the right direction is appreciated! I worked in Dayton Ohio in 1988 at a Richman Brothers store. The store was in the now defunct Salem Mall. I was an assistant manager under the very humorous, Store Manager Richard Wasch. I left a year later for Philadelphia, but I have always wondered what became of the company. I miss the fit of those Adams Row dress shirts, among other things. What great time it was for me, back in the day. Worked there for almost 15 years right out of clooege. Best company I ever worked for until the end. A number of 40+ year service employees then. I srove past the factory the other week, it is sad that time has not been good to the factory, but the spirit of the great people was still in the air. Worked there for almost 15 years right out of college. Best company I ever worked for until the end. A number of 40+ year service employees then. I drove past the factory the other week, it is sad that time has not been good to the factory, but the spirit of the great people was still in the air. I bought a Richman Brothers hat at an antique shop and was wondering if there was anyway to find out what year it is from?